80 Gromits, 10 weeks, 1 city! 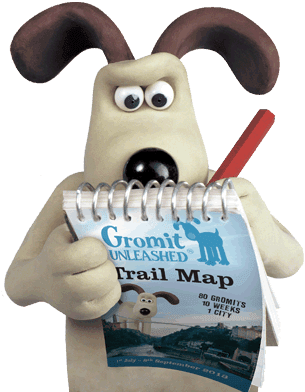 It's the Gromit Unleashed trail and it's on all summer so get out and discover parts of Bristol you never knew existed. Download your trail map and explore the city of Bristol whilst looking for giant dogs that have been painted by artists, celebrities and local people - what could be more fun! Get the app and use your smartphone to guide you around some of the best heritage sites of the city and listen to audio content about some of the most famous landmarks. You can collect a passport and get it stamped at various locations, buy merchandise and all money raised goes to Wallace and Gromit's Grand Appeal, The Bristol Children's Hospital Charity so you can have a great day out whilst also helping others. The Gromits are situated all over the city and surrounding area from Cheddar Gorge to Windmill HIll City Farm and the National Trust's Tyntefield to the beautiful Hawkesbury Upton in South Gloucestershire so this could be a challenge for the whole summer which takes in some of the best places the South West has to offer. In October all the Gromit sculptures will be auctioned to raise money for the appeal so if you have a favourite and want to bid fill out a form here to register your interest.